The Stratographe by Blacksand Genève is a sleek and surprising single-pusher chronograph interpreted in a Tachymeter version for all speed enthusiasts, or with a Pulsometer to measure collectors’ emotions. Blacksand Genève enters a new era with the presentation of its first in-house calibre entirely designed, developed and assembled in its Carouge workshops. The immediately identifiable Stratographe reflects highly contemporary aesthetic codes, while remaining loyal to the “Semper fidelis” approach to traditional watchmaking upheld by the brand. 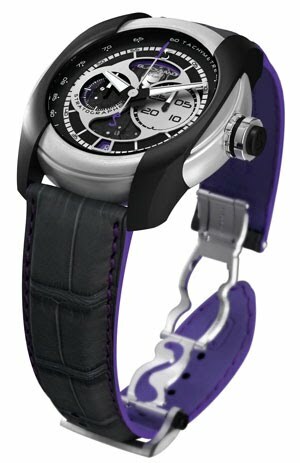 A strong design in shades of purple, grey or black, expressed through an openworked dial featuring two ceramic inserts. The architecture of the distinctively curving case is crafted in titanium and ceramic or in pink or white gold, enabling a fascinating play on personal desires and on materials. 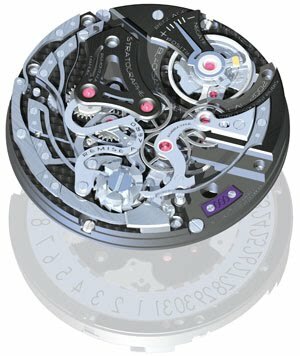 Hand-wound, Manufacture Blacksand CAL 2002 movement, 28,800 vib/h, 50-hour power reserve, Blacksand column wheel and index assembly, chamfered plate and bridges, black circular-grained, sandblasted and satin-brushed motifs.